What is most likely going to be the last of the new works for this weekend's Open House, 'The Painted Ponies' was completed late last night. The image size measures out at 4" x 6". 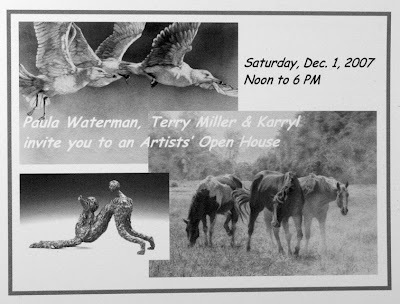 This coming Saturday, Paula Waterman, our sculptor friend, Karryl and I will host our fourth holiday Open House. As mentioned a number of times in earlier postings here, we will all have a lot of new work to show. For those who have not received mail invitations and would like to attend, drop me an email and I will send you directions. We will be 'open for business!' from Noon till about 6PM. A posting today of several of the other 'mini' works I have been working on the past week or so, all for the upcoming Open House next Saturday. 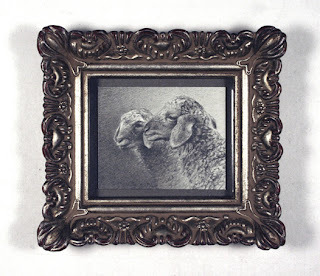 These are truly tiny little works, the frames being less than 4" on the square. I expect there will be more to come. 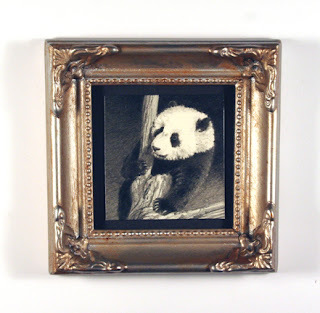 Image size 7" x 5". Feeling a bit overstuffed this morning and I can't quite figure out why! I bet there are quite a few of you out there, that might feel the same way. In any event, some new work in progress here . . . just the beginnings of this one from work yesterday morning and the previous evening. Not much to see really, but then again it does take quite some time for me to layer in the darks like the background of this particular work. Having begun my career as an artist, as a painter way back when . 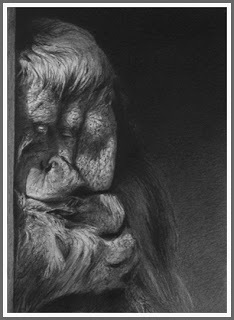 . . as I have said time and time again when asked about my work and my technique with graphite, I tend to work as I did when I painted and as all my painter friends generally work . 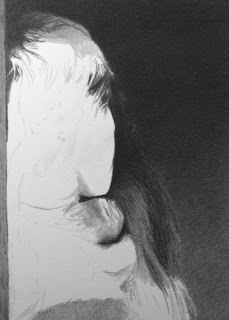 . . by building up layer upon layer, almost like paint glazes, of graphite till I reach the desired intensity of black. I have been asked these questions many times at shows and by young artists and the answer is always the same . . . it takes time! 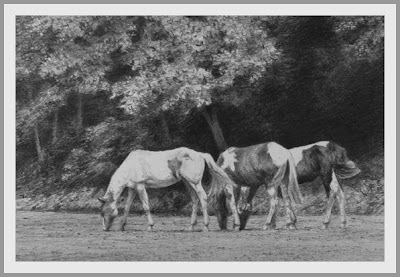 Starting out with a rather hard lead, perhaps 4H and progressively moving to ever softer leads, I try and establish ever darker 'coatings' of graphite, sometimes setting them in between layers with a very light mist of fixative. Using the good 'ole method of cross hatching, each successive layer tends to fill in the 'gaps' created by the slight texture of the bristol board that I work on, ultimately giving me, with best hopes, a nice, even tonal quality. In this particular work, all this began at the top of the background, and establishing the basic outline of the animal and slowly working my way around to the right and down to the bottom of the image. Then, going back over the areas worked with softer and softer leads, F, HB and ultimately a top layer of, in this instance, 2B with a sharp line of delineation around the animal of 4B. 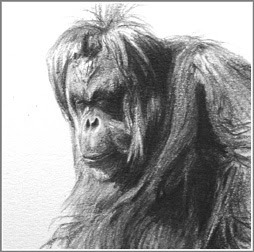 At this stage of the work, I am not sure if the darks have been reached as yet and that remains to be seen when I finally get to working on the orang itself. If I find I need to pump up the darks in the background, I can still over layer with 3B or 4B as needed to bring out the depth of the shadows. I am pretty happy with the way it looks now, but we shall see what it looks like again at the end of today. 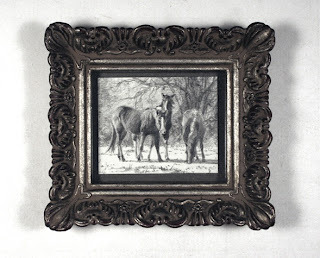 My good friend, Cole Johnson, uses powdered graphite a lot in his beautiful renderings of animals, resulting in an almost air brushed quality to his finished works (one of which I am proud to have in my own personal collection). 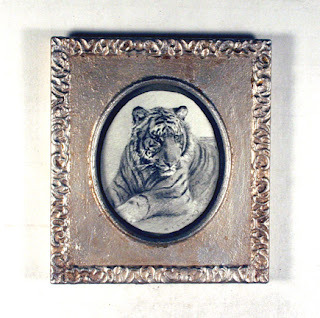 It works for him, but since I have established my particular technical approach to the way I work based upon what I have outlined here, I doubt I could make use of the same powder in my work without coming up with tornadoes of graphite spilling out all over the studio. 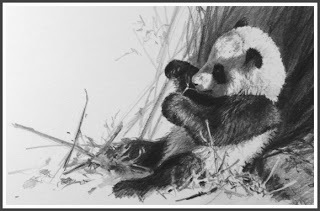 In the end, it all comes down to making use of the same medium in vastly differing ways and that makes for very interesting 'variations on a theme' for those of us who have chosen graphite as our medium of choice. End of Layering Lesson 101! this one is a bit under 4" x 6". for the upcoming Open House. come off the drawing board this week. 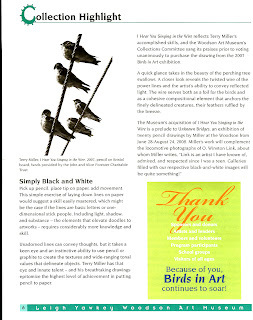 As noted in an earlier posting here in the blog pages sometime last month, my work titled 'I Hear You Singing in the Wire', featured in this year's Birds in Art exhibition, was purchased by the Woodson for the permanent collection. In yesterday's mail, this month's copy of Vista arrived, the monthly newsletter to museum members published by the Leigh Yawkey Woodson Art Museum in Wisconsin, and in its pages I was most pleased to find this full page discussion of my work and its recent addition to the collections. As noted before, I am most honored to have this work join several others of mine in the collections at the Woodson and particularly pleased with the kind remarks about this work and my upcoming exhibition, Unknown Bridges, which the Woodson will host next summer. My deepest thanks to Kathy Foley, the director of the museum, and all others involved in the Collections Committee for choosing my work from the 100 plus works included in this year's exhibition. This work, along with 59 others selected from the total exhibiton, will go on tour shortly to several other venues around the country. 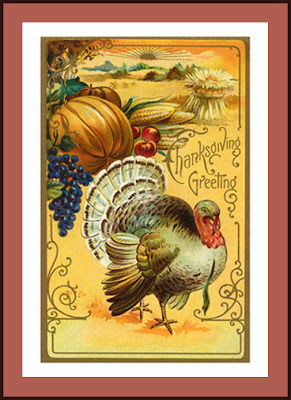 A listing of these venues can be seen on the museum's web site, as well as included in my Fall Newsletter, currently posted on my web site, linked below and to the right. of one of the National Zoo orangs. image size - 5" x 7"
Last week, prior to leaving for the Waterfowl Festival, I and friends in from Cincinnati drove into DC to see the Edward Hopper exhibit at the East Wing of the National Gallery as well as the Turner works in the main building. The Hopper exhibition, which runs through January 21, 2008 in Washington, DC, knocked my argyles off! I knew it would as I have admired his works since art school days. 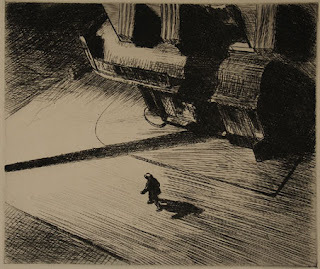 Seeing a large body of his works all together, oils, watercolors and etchings, really brought home the tremendous impact that his work had on many other artists of his time and after, not least of which yours truly. 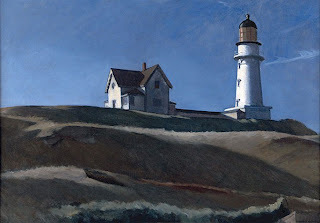 I have just begun to leaf through the catalog from the exhibition and already am taken with Hopper's unique look at the world around him and especially the way he has used light and shadow in the vast majority of his work to convey a mood that is at once, almost surreal yet comforting at the same time. 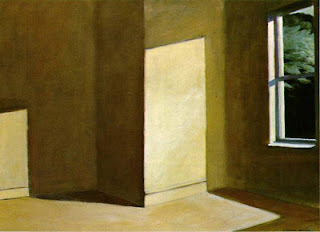 'What I wanted to do', Hopper was quoted as saying in reference to his approach to his work, 'was to paint sunlight on the side of a house.' 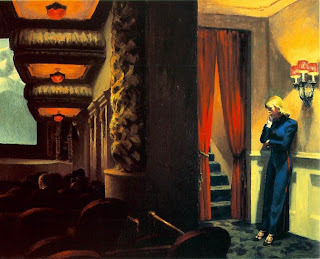 In this simple statement, Hopper summed up for me at any rate, what art sometimes comes down to; the way in which each individual artist chooses to focus their work, what gets their creative juices flowing and what sets the mood of a vast body of their output. 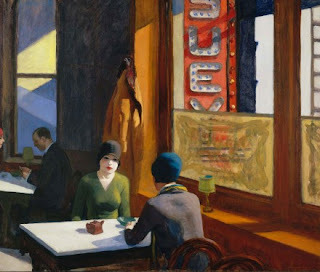 Hopper spotlighted the 'ordinary moment' as in the work, 'Chop Suey' from 1929. To me and any number of his critics, his work speaks of melancholy and being a rather melancholy person myself, I find it quite easy to relate. I always come away from a visit to a museum or exhibition or even a large scale group art show, like the recently held Waterfowl Festival, invigorated, refreshed and filled with the joy of being an artist; being someone who, in some small way, can hope to tap the inspiration within and make it come to life in a work of art. 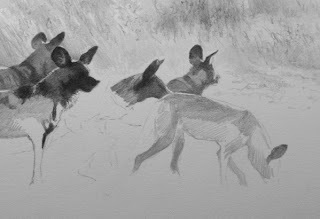 Following along the lines of the work that I was involved in just before the Waterfowl Festival, I continue to delve into my African reference, today starting a small work of wild dogs. It has been about ten years since I last did a wild dog work and I was happy to dig through images from my Botswana trip in the summer of 1999 yesterday, to refresh my memory and get the creative juices flowing. 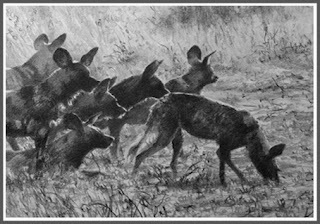 This will be one of several works I shall do for the upcoming Open House with African wild dogs as subject matter. Thanks to all who stopped by to say hello at the Waterfowl Festival this past weekend. Though the weather was a bit iffy on Friday and Saturday, Easton played host to thousands of visitors. Now, studio time will be occupied in preparation for my shared upcoming Open House with fellow artist and friend, Paula Waterman on Saturday, December 1. 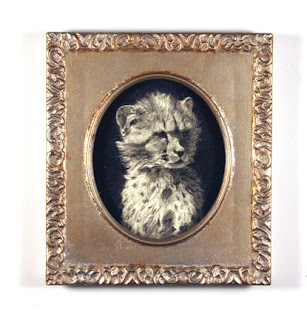 Many new works will be shown on that day and also here on the blog over the next three weeks, so keep an eye out! This coming week will mark the opening of the 37th Annual Waterfowl Festival in beautiful and historic Easton, Maryland. Spread out in venues throughout the town, the Festival hosts well over a hundred fine artists, carvers, sculptors, and craftspeople not only from the eastern seaboard but from the west coast, the midwest, the southwest and Canada. Opening to the public on Friday morning, November 9th and running for three full days, the Festival is a great place to spend a crisp fall weekend. I believe this to be my 15th year of being a part of this wonderful gathering of artists and will hang about 30 new works, many of which have been seen here in various stages of completion over these last few weeks and months. So, if you are in the area or within a short drive, consider joining me in Easton next weekend! Here is a link to the Festival's home page for more information . . The new work, done.Image size 7" x 5".